TDP is a powerful cloud-based platform and methodology that enables teams to continuously assess and improve their operating performance. It helps teams at any level to identify barriers to performance and helps reveal where to invest energy in improving team-working effectiveness. The Team Diagnostic Profiler has multiple applications and can be deployed with all teams from the most senior to the most junior, from project teams to traditional teams, from virtual teams to teaming work groups. TDP is designed for use by team leaders in a self-serve mode following minimal instruction and training. 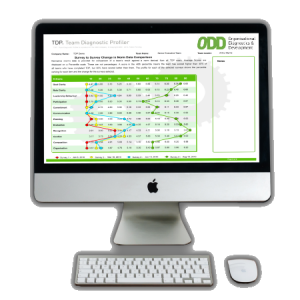 The TDP analysis methodology and comprehensive resource material is an easy to follow process for the team and is provided for all elements of the TDP process. Most importantly TDP interpretation guides support the team in asking the right questions of themselves in order to correctly diagnose their current status/condition and from there plan actions to close the gaps in team performance that they have identified. 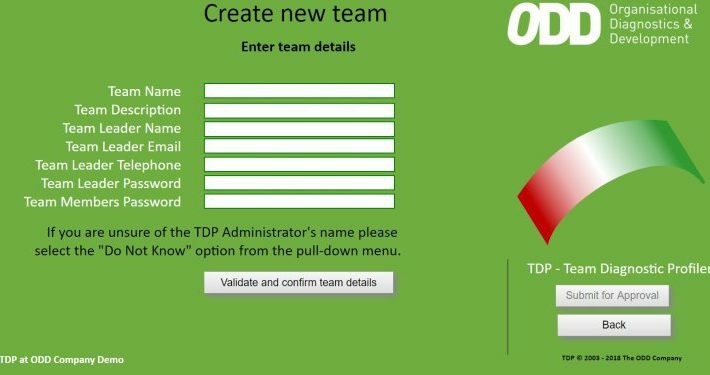 Self-serve and managed by team leaders, team members take just 5 minutes to complete the TDP online assessment, ideally once a quarter or more. 2 hours is required for the team to debrief and plan actions either in self-serve mode or with a facilitator. Ongoing measurement improves the operational effectiveness of your teams while company-wide rollout further increases its impact. 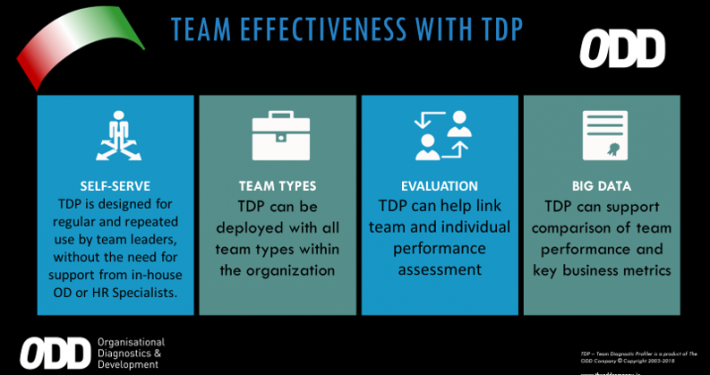 TDP produces instant online reporting and through our advanced analysis methodology helps team leaders assess optimal team functioning and follow the TDP process to develop improvement actions. To deliver improved effectiveness teams need to take time out from the day-to-day to think about and discuss not just “What” they do but “How” they do it. core your HR systems and business processes. TDP can accommodate teams of various sizes from 2-20, but we recommend up to 10 is optimal. TDP is applicable to any team type – Traditional, Project, Teaming Work Groups, Virtual – temporary or permanent. It is used in many sectors including Technology, Financial Services, Retail, Travel & Tourism, Food Service, Healthcare, Manufacturing, Media & Advertising and Entertainment. No magic formulas, no silver bullets, TDP is based on the belief that all teams hold the answers to their own effectiveness, but need dedicated time to be reflective and take time out of the day-to-day to talk about themselves and how they work together as a team. 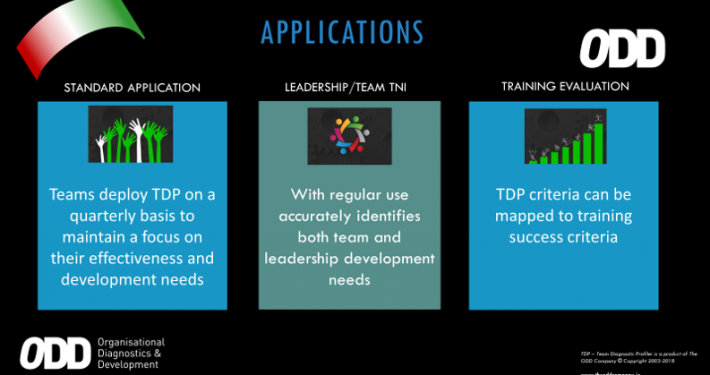 The TDP instrument and methodology is designed to create the agenda for a structured team discussion using objective data derived from the team members. 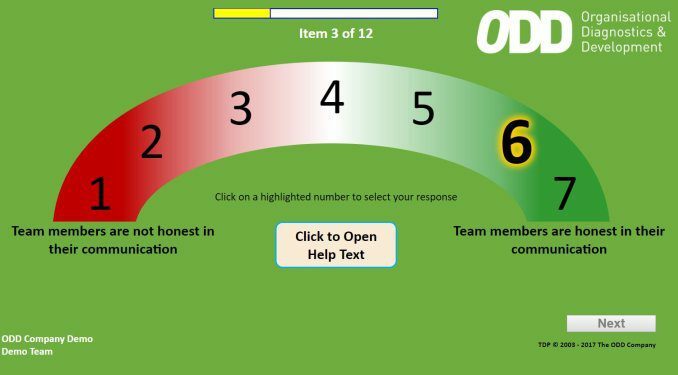 Repeated use on a regular basis allows the team to track the impact of their improvement actions through the assessment to assessment comparison reporting function. TDP is focused on the issues of team effectiveness and not the behavioural composition of the team in terms of member personalities. Whilst we recognise the value of behavioural profiling we have focused on the issues that a team can manage and change to drive their effectiveness. In doing so the team can ultimately deliver the conditions of a safe psychological environment where all team members can without fear ask any question, can admit to weaknesses, can offer ideas and can challenge the status quo. In other words TDP ultimately creates the learning environment that the team needs to innovate and drive improvement that leads to increased effectiveness. Based on a validated academic model of team life TDP is about all teams in an organization and not just the “problem” team. 90% of output in today’s organization is happening through teams. The team is the most important production unit in the organization today. 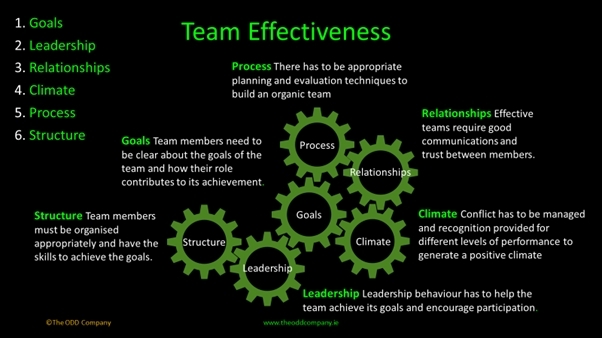 Every team can be more effective than it is today, but they must take time to reflect and discuss their modus operandi. With TDP a typical work team need only do this 4 times a year (once a quarter) committing no more than 2 hours to the discussion. A total of 8 hours in a 12-month period, can drive up to 20% improvement in effectiveness and productivity. TDP is designed to be self-serve for the team leader and does not require ongoing” Expert” facilitation. 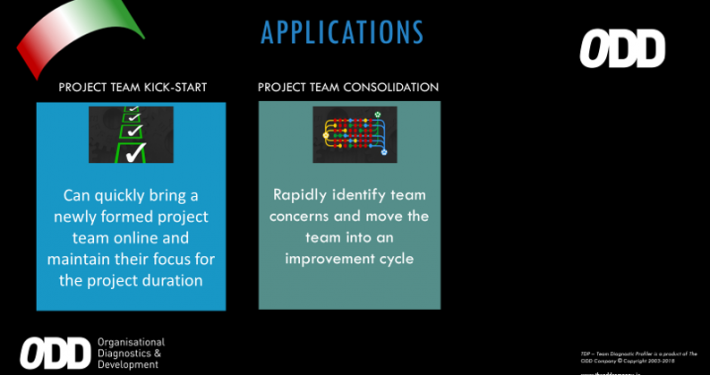 Once deployed TDP becomes an embedded process for the team and is implemented regularly without placing unreasonable time demands on the team. It is easily accommodated in a team’s ongoing schedule. The comprehensive resource centre contains supporting implementation guides and documentation and over 40 articles on team work (regularly updated) and related matters. 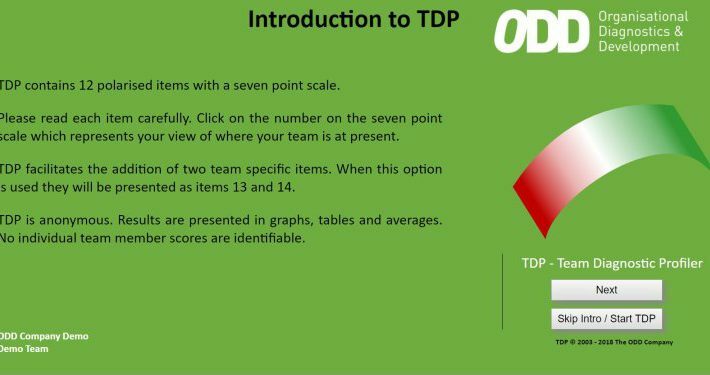 TDP is not only a team effectiveness improvement tool but is also a learning suite educating the team leader and team members on all aspects of team functioning through usage and application. We have been helping client organizations improve the performance of their teams, managers and leaders since 1993. We are OD team specialists with comprehensive knowledge of how organizations work and a clear understanding of the importance of team based culture in delivering long-term competitive advantage. Because every customer is on the same TDP release, our consulting partners use the same methods and tools in each engagement. These provide significant advantages for customers during initial deployments at senior team levels and later for cascading adoption of TDP company-wide. Because we all speak a single language from the same processes and use the same methodology we ensure reliable and consistent outcomes for your teams every time. These services include Corporate Team Strategy (CTS) development, senior team facilitation and TDP Administration, Interpretation and Expert training. The ODD Company Professional Services ecosystem consists of The ODD Company Professional Services group and our specially trained consulting Partners. Together we collaborate to successfully deploy TDP either as a standalone process or as part of a larger corporate initiative. All TDP consultants go through a rigorous training and certification program to deliver the best results for our customers. Our ultimate aim is to deliver a truly self -serve environment for all team leaders and teams. Get the most out of your TDP engagement by taking advantage of the knowledge and expertise of these highly-trained professionals. CTS is an integrated approach to teamwork in an organization. It considers when teams are appropriate, what are the minimum standards for a team, what does success for team look like and how is it measured, how are business metrics integrated with team performance (including performance management). We provide the support to develop such a strategy and can even support its implementation if required. 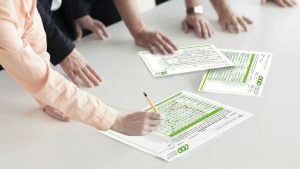 Designed for the CEO and their team – this is a detailed programme supporting the top team to identify clearly their mission statement (as opposed to the organizations mission statement), identify their key stake holders and map them to the mission statement, develop and agree their rules of engagement, complete a team role clarification – understanding team roles in contrast to functional roles, developing action plans. TDP is fully integrated with this programme as the platform and the means to ongoing reflection to enable ongoing team effectiveness improvement. Designed for the CEOs direct reports and their respective teams. The Omega programme is similar to the Alpha programme but takes less time investment assuming the leader has completed the alpha programme with the CEO. There are a number of specific roles which either your staff or your chosen consultant can deliver. Ongoing training and educational courses are available thereafter to ensure your staff are fully appraised on the latest techniques in rolling out TDP across your organization. TDP Expert – All of the above and trained to a higher level enabling onward training of TDP users in your organization. TDP integrates easily with major HR and Payroll systems and most Business Process and KPI measures. So, it quickly becomes part of your standard team evaluation and performance measures. We can help assess your individual needs and advise on how best to move forward. We strongly recommend in the development of a CTS that the relevant metrics and/or BPIs are identified for correlation with TDP output.